Observation - Puss moth caterpillars - Global. 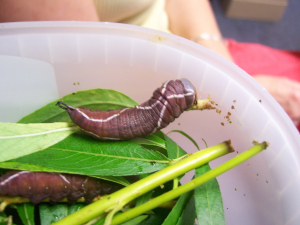 Description: Puss moth caterpillars being reared by a colleague, feeding on willow leaves. One photo shows the usual green colour, the other is darker brown as it gets ready to spin its cocoon. Puss moth caterpillars being reared by a colleague, feeding on willow leaves. One photo shows the usual green colour, the other is darker brown as it gets ready to spin its cocoon.